Working for Wildlife, Working for You! 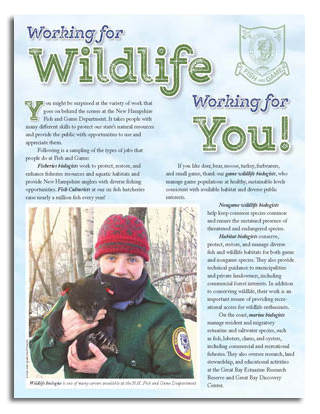 You might be surprised at the variety of work that goes on behind the scenes at the NH Fish and Game Department. Get involved as a volunteer for Fish and Game's programs and events! 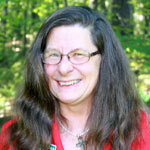 Want to learn more about our volunteers? Read about them. Opportunities include becoming a volunteer instructor for Let's Go Fishing, OHRV safety programs, or Hunter Education; a Wonders of Wildlife Docent or Fish & Wildlife Steward; or a Watershed Education Program liaison in schools to assist with water quality, macroinvertebrate, and fisheries programs. Help out at one of Fish and Game's education centers, pitch in to assist the Nongame and Endangered Wildlife Program, or help monitor wildlife. Select tab for area of interest. Description: Citizens are asked to report sightings of turkey flocks seen by filling out a simple electronic survey form posted on the Fish and Game website. Please do not report multiple sightings of the same flock. Description: Help monitor state endangered and federally threatened piping plover shorebirds as they nest and raise their young along the NH seacoast. Volunteers record observations, talk with beach goers, and help maintain fencing and signage. Volunteers must be comfortable working independently and outdoors. Contact: Brendan Clifford at Brendan.clifford@wildlife.nh.gov or call the piping plover monitor at (603) 419-9728 (Note: phone only active May through July). Description: Report sightings of reptiles and amphibians to assist biologists in determining species abundance and distribution. Reports include species name, date, location, and a photo for verification. Reports of both rare and common species are important. Verified reports of rare species locations are mapped and stored in a database used for land protection and conservation purposes. Description: Count bats as they exit their summer roost in June, then again later in the summer to see how the colony has grown as pups begin flying. Instructions and documents are available online. Description: Stewards are trained to present programs to adult groups about the federal Fish and Wildlife Restoration Program and how it benefits the work at NH Fish and Game. Contact: Mary Goodyear at mary.goodyear@wildlife.nh.gov or (603) 271-6649. When: Primarily weekends, holidays and some weekdays during April through June. Description: Assist Fish and Game staff in monitoring coastal fish ladders during the spring and early summer fish migrations. Time commitment ranges between 3 and 8 hours per day, depending on the project. When: weekdays (Monday – Thursday) and holidays during March and April. Description: Assist Fish and Game staff in sampling coastal rivers for rainbow smelt spawning activity during early spring. Time commitment ranges between 3 and 8 hours per day, depending on the project. Description: Volunteers of all experience levels are needed to report on striped bass fishing trips taken in New Hampshire waters. Information requested includes catch and effort information about each trip taken, whether for only a single trip or many. Anglers are also requested to measure the lengths of all striped bass they catch, including those fish that are released. Description: Attend a comprehensive training program to assist teachers with classroom curricula projects on watershed ecology and management strategies to improve and/or maintain the water quality in their watershed. Description: Attend a comprehensive training program to develop classroom curricula on watershed ecology and management. Water sampling and macroinvertebrate collection, ArcGIS computer models, and setting up a fish tank in the classroom are just some of the activities students may use to learn about how to improve and/or maintain the water quality in their local watershed. Description: Attend training in one, or all areas of interest including fly fishing, ice fishing, saltwater fishing and/or fly tying and then sign up to teach a whole class on your own or work with another instructor and just teach parts of a class. Description: Become certified to teach basic hunter/bowhunter education courses, by New Hampshire State Law these courses are required for every first-time hunter. Description: Become certified to teach trapper education courses, this course is required for every first-time trapper and is also required to become a licensed Wildlife Control Officer.. Description: Help with shooting range supervision, trail and grounds maintenance, explaining exhibits to visitors, leading and assisting with center activities, office/receptionist work and hunter education instruction. Description: Become certified to teach OHRV Safety Education Courses. Description: Two main volunteer opportunities: Education Program Volunteers and Exhibit Room Volunteers. Education volunteers conduct programs on cultural and natural history for school children and can also help with summer kids' programs. Exhibit Room volunteers meet and greet guests, monitor the discovery tank, take care of the store, and other duties. There is also a need for volunteers to help out with the maintenance of the grounds and gardens at the Center and on other Reserve properties. Where: Route 3 between Carroll and Whitefield. Description: Greet visitors, answer questions on fish-raising, stocking and the theme exhibit exploring watersheds -- what they are, how plants, animals, and humans interact and impact them and/or assist with staff with hatchery operations. Description: Greet visitors, answer questions on fish-raising, stocking and the theme exhibit – Wildlife, People and the Land: the different natural communities, their associated wildlife and human interactions and/or assist with staff with hatchery operations. Description: Help is needed with ongoing improvement projects at Fish and Game's summer camp for youth. Volunteers can join a work party, contribute specific construction skills or materials, take on a particular project, or help raise funds for an endowment to ensure that camp is always here to nurture New Hampshire's future outdoors-men and women. Description: Help us get growing from the ground up! Great Bay National Estuarine Research Reserve is creating a backyard wildlife garden on the shores of the Squamscott River in Stratham. It will be a place where people can come learn how to enjoy a beautiful, low-maintenance backyard, while providing shelter, food and water for wildlife. The garden will be established and maintained by community volunteers. Read about some of Fish and Game's many volunteers, past and present, who have contributed to the work of the Department. These are just a few of the hundreds of people who contribute their time and expertise to Fish and Game every year. Select an image to read about the volunteer. All files are in PDF format.